The day after our visit to Jökulsárlón, our main goal for our penultimate day in Iceland was to get over to Vestmannaeyjar and visit the Eldheimar Museum. Vik is a very small town that we zoomed by on our journey to Jökulsárlón (plus it was raining and we really didn’t want to stop). It was quite windy (this would be the theme for the day…and it a theme for many days in April in Iceland) when we stopped in the town on our return ride. Above is a picture of the coast and rock fixtures from the town of Vik, approaching from the west on the Ring Road. There is a high cliff with an amazing nesting of birds, most of which you can see in the photo. The beach is all black lava rock as far as you can walk or see. We got back in the car and drove around the cliff/bluff with the nesting birds to get to the other side. The wind was so strong that my lovely wife leaned into it to see if it would hold her up…and it did. The rocks have been worn so much by wind, surf and rain that they look man-made. The sign at the entrance to the beach (in addition to warning about “death via undertow” says this is columnar basalt. Columnar basalt is formed when magma cools slowly and cracks into columns, usually hexagonal, as the surface area decreases. The columns always stand perpendicular to the cooling surface and can be horizontal, spreading out from the centre, or vertical. The varied forms of the columns are perhaps due to this being a cross-section of an ancient volcano, as dykes, small magma chambers and lava sills can be found among other rock formations. According to legend, the columns are trolls that were frozen. These columns were also filmed in an episode of Game of Thrones (many settings were filmed in Iceland). Through the surf and wind we could see Dyrhólaey, the arch. The ferry to the Vestmannaeyjar islands has different departure times during the off-season. It leaves from a nondescript port about five minutes off the Ring Road. There is not a town there – just a port with a check-in, bathrooms and a few machines. We could have parked our car and went over on foot, but the weather was terrible. So we took the trusty brown rental car into the bowels of the ferry and off we went. It was a rough but scenic ferry ride over to the islands. As usual, the weather seemed to clear in the middle of the day. But, as can be seen by this video out the front of the ferry, the ride was quite rough. The ride back was even rougher. It was even more fun outside of the ferry, especially as the islands came into view. Vestmannaeyjar consists of about 15 islands (good map of the archipelago here). The largest is Heimaey, our destination, which is about 5.2 square miles. The rest of the islands are uninhabited, although we did see two on the way in that had small cabins on them. My lovely wife was smart – she stayed inside. The waters were obviously calmer inside the bay as we docked in Heimaey. We found the car and made the short drive to the museum. Our main reason for taking the adventurous ferry ride was to visit the Eldheimar Museum in Heimaey. Called the “Pompeii of the North”, this museum walks through the 1973 eruption that forced the evacuation of the island. When the eruption occurred, all 5200 people on the island were evacuated. Some have never returned, desiring not to live on top of an active volcano…though this describes large parts of Iceland. The eruption formed the volcanic cone known as Eldfell, which you can see in the photo below behind the Museum. The museum has an excellent audio tour and a movie in a theater in the middle of the first floor. The showpiece of the museum is a house that had been engulfed by the lava flow and was unearthed and left as is, with the lava inside it. There are light fixtures, plates and all manner of household items….and a LOT of dried lava. There is a display that shows how the lava threatened the city and the port. They were employing water cannons/hoses to try to stop the flow, splitting between the port (which is vital for the islands economy) and the city. They eventually had to move all of their efforts on the lava trying to close the port, as without the port there would be no city. The picture below shows a wheel that can be twisted to show the lava flow over time. In the audio presentation and the movie we sat through, they stated that the lava ended up creating a better and protected harbor. Heres another good map showing the lava flow. An interesting connection: the book I picked up at the Bobby Fischer Center was written by an Icelandic chess master who as a youngster was one of the people evacuated to Reykjavik during this eruption. 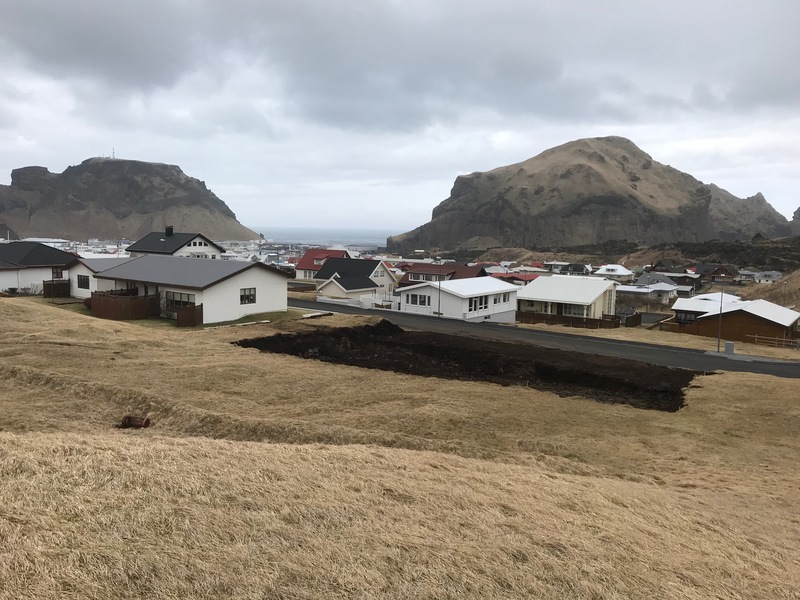 There is an additional audio tour on the second floor that goes through the 1963 eruption that formed the newest island in Vestmannaeyjar, the island of Surtsey. As I mentioned, the ferry times were less frequent during the off-season, so we ended up with quite a few hours to explore the small town of Heimaey. The rest of the island has an airfield and not much else. We decided to grab a meal in town at a place recommended by the lady manning the ticket booth and audio tour distribution at the museum. The restaurant is named Gott. Even though the downtown area is small, it took us a bit to find a place to park. As we drove around the town, we could see Eldfell and Helgafell (the other volcano on the island), and realized that these people, like our friends on Hawaii, are living in the shadow of an active, unpredictable volcano. By this time (the penultimate day of our journey, I’d tried many of the Icelandic beers I could find. Our waitress at Gott said she had a local beer brewed on the island. She brought it, and it was good…and had a cool label. I enjoyed a red ale called Eldfell…can’t get much more local than that. I asked where the brewery was and she pointed across the street. The brewery opened at 4. Our ferry was at 6:30. The timing was perfect so we walked across the street. The photo above is looking back toward the other volcano on the island, Helgafell, as we walked across the street. We walked into to a nice, large brewpub called The Brothers Brewery. Jóhann, one of the founders and owners, was at the bar, and his enthusiasm for beer, brewing and his and other breweries was absolutely contagious. For a while, my wife and I were the only customers in the place, and Jóhann and his wife talked beer, the island, beer, kids and occasionally programming. Jóhann is a programmer by day, but his passion is brewing. He talked about traveling to Maine and Boston, meeting with other brewers and brewing beer with them. When I asked him if he got a joint release out of it, he said what he got out of it was the enjoyment of brewing, and more knowledge of different techniques. It’s a joy to meet someone passionate about a hobby or profession…and if that passion includes beer, it checks two boxes on my list! We tried their IPA (Gölli), their double IPA (Horfnir Humlar, which is a bit different every month), the milk stout, a saison and many others. The double IPA was definitely my favorite, but the Gölli was a close second. The brewery also has annual release beers are named after certain people (or types of people) on the island. All of the labels are well done, and their beers appear to be getting around the island (based on what I can see on UnTappd. Jóhann, if you are reading this – send beer to Austin! I bought a Gölli to go, and Jóhann graciously threw in a Founders Canadian Breakfast Stout (CBS). Then we headed for the rough return ferry ride. For our last evening in Iceland, we found an AirBnB at a horse farm with an outdoor hot tub – one last attempt to see the Northern Lights. It was only a ferry ride and a short drive to the other side of Selfoss – close enough to the airport for our departure tomorrow but far enough away to see the lights (we hoped). As we pulled into the driveway, a large, white, wolf-looking dog was sitting there to greet us. He came up to the open window, and then followed us into the room. His name is Svartur (we found out later). He, like all creatures, liked my wife. The instructions on filling the hot tub were – turn on the button in the bathroom, and turn the crank to stop the drain. I was wondering where the heater was, but the water came out hot. It filled up quickly, and, taking our newly acquired beers, we got in…and watched the clouds. No glimpses of the northern lights on this trip. But we were in a hot tub, on a horse farm in Iceland, drinking beer from someone we spent quality time with. It was another great evening. And since it was a horse farm, of course, there were horses.